Posted May 2, 2016 by kelley & filed under Uncategorized. 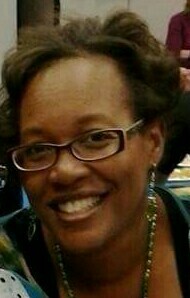 Hi all, Kelley again, here to report yet another scholarship recipient attending Prestige Medical Solutions, Kisha J.! Kisha began class on April 18th along with the other three myCNAjobs Scholarship recipients and is learning more about the healthcare field than she could have imagined! Kisha is filled with love and compassion that she wants to spread to those in need. Alex, the Program Director at Prestige Medical Solutions is certain that Kisha will have a very successful as a CNA”. Kisha plans on learning as much as possible while in CNA School and is excited to begin her career as a CNA. Eventually Kisha hopes to delve into caregiving even further and in the future she plans on pursing a career as a nurse! Great caregivers are not easy to find, so when the myCNAjobs Scholarship team finds a passionate caregiver, such as Kisha, we are overjoyed to be able to provide them with a full-tuition scholarship to attend one of our partnering CNA schools. Prestige Medical Solutions was generous in offering four scholarships via the myCNAjobs Scholarship Fund and is dedicated to supplying the healthcare field with caregivers that are determined to provide excellent care and driven to make a difference in this growing field. The myCNAjobs Scholarship Team and Prestige Medical Solutions are thrilled to support Kisha and are excited to watch her thrive within the healthcare field. Stay tuned, we will be following up with Kisha J. about how classes are going in a few weeks! Best of luck to Kisha as well as the other three myCNAjobs Scholarship recipients! Until next time, check out Latoya’s story! Posted by chanelle & filed under Assisted Living Jobs, Become a Caregiver or CNA, Caregiver CNA Duties, caregiver cna interview, Caregiver Job, Caregiver Training, CNA Job, CNA School, Home Health Aide Job, Live In Caregiver, Working as Caregiver CNA. Happy first-Monday-of-May! There is no better time to share some great news about the myCNAjobs Scholarship Program. Shelley W. was recently awarded a CNA scholarship to attend the CNA program at Colorado CNA Academy. Colorado CNA Academy is waiving the full tuition for Shelley to attend their program. Yes you read that right, the full tuition! After being a stay at home mom for many years, Shelley decided it was time to take a new approach in the healthcare field. Shelley had felt as though she, “wanted to find something compassionate and help elderly people who are in need of assistance.” It was then when Shelley realized becoming a certified nurses assistant would be perfect for her. It turns out for the past year, Shelley has worked as a caregiver at a local homecare agency within her community. Now after being granted this great opportunity, there is no doubt that Shelley is ready to make a difference in the healthcare community as a CNA. Michelle Ohnemus, owner of Colorado CNA Academy, located in Golden, CO believes that Shelley will be a great addition to their program. Shelley is set to begin classes at Colorado CNA Academy on May 9th. Our team at myCNAjobs is super excited to see all that Shelley will accomplish during her time in the program! We believe that it is truly rewarding to support such a caring individual to make an impact in our home healthcare community. Us here at myCNAjobs will be in contact with Shelley throughout the entire duration of her time in the program, as well as help her find a job after she becomes certified. How exciting right? As for now, stick around for more great stories about the myCNAjobs Scholarship Program! To learn more, check out some of our recent scholarship winners here. Posted April 25, 2016 by kelley & filed under Assisted Living Jobs, Become a Caregiver or CNA, Caregiver CNA Duties, Caregiver Resources, CNA School, Home Health Aide Job, Live In Caregiver, Working as Caregiver CNA. Hi all, I am here to report some extremely exciting news! Prestige Medical Solutions recently became a participant in the myCNAjobs Scholarship Program. Prestige has offered to waive tuition for 4 students this class period. One of the students, Latoya C., is convinced she will change the lives of those in need. Latoya has been a caregiver for “three years and counting”. However, she has been yearning to become a CNA for many years because she “loves seeing the smiles on the faces of those she cares for”. Latoya does not look at becoming a Certified Nursing Assistant as a job but as “something [she] loves to do and getting paid to be a CNA is just a bonus”. Latoya plans on absorbing as much information on becoming an even better caregiver as with the aspiration to become a nurse one day. Latoya looks forward to forming close, personal relationships with those she provides with her care. She recognizes “many people do not know what love is”. She aims to show her patients love through exceeding what they anticipated having a caregiver would be like. It is students like Latoya that the myCNAjobs Scholarship Team and Prestige Medical Solutions aspires to waive full CNA tuition for and support in their careers as caregivers. Alex, the Program Director at Prestige Medical Solutions, stated “Prestige Medical Solutions is confident Latoya will go on to positively impact many lives and achieve great things in the healthcare field”. Up next for Latoya is a 6 week course intensive course but in the end, Latoya will walk out with a CNA, HHA, Dementia Training, and CPR Certification. After that, she will be out making a difference in the healthcare field! 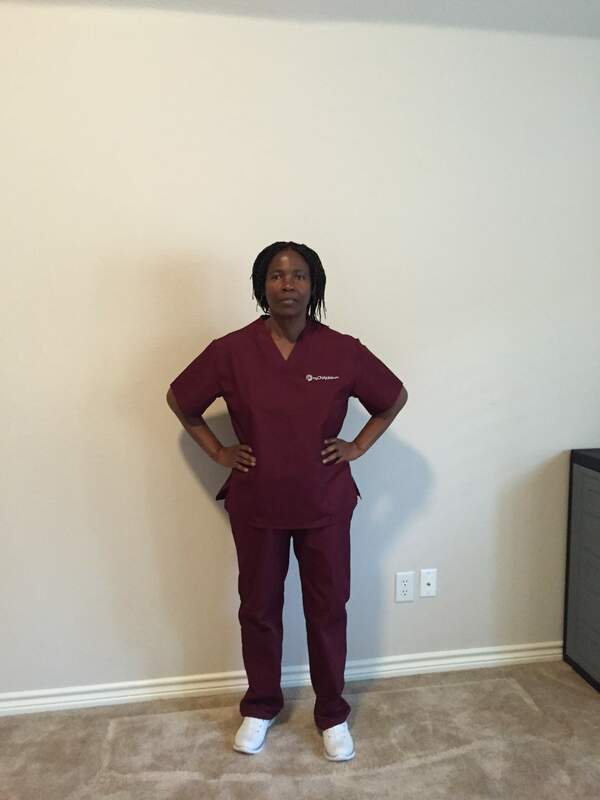 Latoya will be receiving her myCNAjobs scrubs as a “Thank You” for all she has and will do to for others! Stay tuned! I will have more to report when Latoya has been in class for a few weeks! 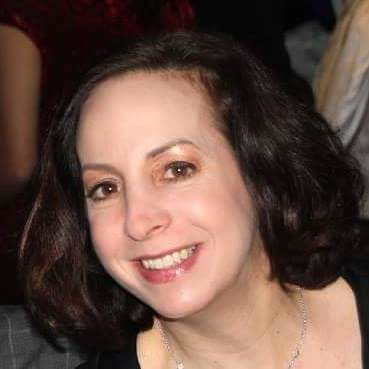 If you liked this BLOG try reading this on about Ilene W.
Posted by kelley & filed under Become a Caregiver or CNA, Caregiver CNA Duties, Caregiver Training, CNA School, Home Health Aide Job, Live In Caregiver, Working as Caregiver CNA. Kelley, here, to fill you in on super exciting information! Prestige Medical Solutions has provided four scholarships to four outstanding caregivers via the myCNAjobs Scholarship Fund. Prestige offers a unique course that allows students to receive their CNA, HHA, Dementia Training, and CPR certification all in less than 2 months. Prestige is piloting this concept and is thrilled to have four amazing myCNAjobs Scholarship Recipients pioneer the program. One of the scholarship recipients, Ilene W., began classes this Monday, April 18th and is thriving! Ilene is currently an EMT in NJ and has a long history in caregiving. She loves the medical field but is ready to engage in a career that is a little less fast paced and adrenaline inducing. Ilene “wants to get more involved in the lives of these patients, more so than [she] does at her current job” by becoming a certified nursing assistant. Ilene has 3 kids that are also interested in health professions. Her daughter is currently in nursing school and her son is headed to medical school shortly. Ilene’s “calm nature, patience, empathy, and compassion” that she has attained from not only being an EMT but also a mother, make her a perfect fit for the home healthcare field. It’s refreshing to know great caregivers like Ilene are headed into the field. Alex from Prestige Medical Solutions is certain that Ilene will excel in the CNA/HHA Program. Prestige Medical Solutions is a vocational school located in North Plainfield, NJ which specializes in innovative career training. Some of their innovations which put Prestige Medical Solutions above the rest include online training, a career portal that guarantees a quick access to job opportunities, and professional development seminars. Prestige Medical Solutions and myCNAjobs are thrilled to support such an amazing Caregiver through the myCNAjobs Scholarship Fund! 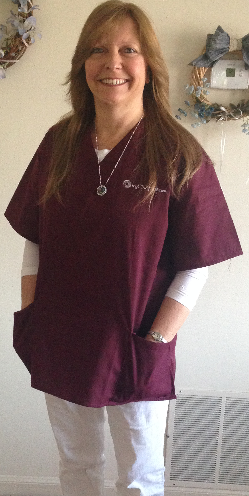 As a thanks to all she has done for her community, myCNAjobs sent a pair of myCNAjobs scrubs to Ilene as a “Thank You”. Tune in soon! There will be more about Ilene’s story in a few weeks! Posted April 19, 2016 by chanelle & filed under Assisted Living Jobs, Become a Caregiver or CNA, Caregiver CNA Duties, caregiver cna interview, Caregiver Job, Caregiver Training, CNA Job, CNA School, Home Health Aide Job, Nursing Job, Working as Caregiver CNA. Hi Everyone! It’s Chanelle with the latest news about the myCNAjobs scholarship program! Nelleta attends the program for five weeks, daily classes Monday through Thursday and in that time is covering a total of 24 chapters and clinical classes. Us here at myCNAjobs are incredibly proud of Nelleta for attending every class and passing all of her exams. So what’s next you ask? After completing the 100 hour program, Nelleta hopes to find a full-time position as a caregiver within her community and is driven to expand her education even further. She explained to me that ever since she was a little girl growing up in Jamaica, she had always dreamed of becoming a nurse. What better way to start your nursing education than to become a certified nurses assistant right? As a final word from us here at myCNAjobs, we could not be more proud of Nelleta. We can’t wait to see what you do with your talent because we know others are going to need it. For those that want to learn more about the CNA scholarship opportunity, you can fill out an application here. We will be back with more news shortly, stay tuned! Posted April 15, 2016 by maggie-thompson & filed under Assisted Living Jobs, Become a Caregiver or CNA, Caregiver Job, CNA Job, CNA School, Home Health Aide Job, Working as Caregiver CNA. Good morning everyone, it’s Maggie here on the myCNAjobs’ scholarship team. I have some exciting news to share with our readers out there. One of our first recipients who received a scholarship to become a CNA has almost completed her course at Larock Healthcare Academy in Columbus, OH. Neat, isn’t it? I thought so and thus why I wanted everyone to know about it as well. Henrietta H., recently moved to Columbus where she found out that she needed to become state certified to be able to continue doing what she loves. Rather than making a hard decision to quit caring for seniors as a companion, she took the plunge and applied for the myCNAjobs Scholarship. We could not be happier that she did. Once Henrietta finishes up her two week course and clinical hours, she will be able to sit for the State Exam. By receiving this license, numerous doors will open up for Henrietta and she will have the opportunity to further her career within the healthcare field. After asking Henrietta if she had anything to tell the myCNAjobs team, she responded saying, “Thank you so much for this opportunity, it truly has been a blessing. This scholarship has allowed me to train, graduate, and become state certified within two weeks. I am very excited to be able to begin to work within the home health aide field at government facilities in Ohio, now that I have the certification.” Henrietta, everyone at myCNAjobs is so proud of you and it is humbling to know that we are putting such dedicated, knowledgeable, and sincere caregivers out into the healthcare field. Larock Healthcare Academy and myCNAjobs have been working closely together and will now be offering one scholarship per class session. Their next start dates are May 9th and June 16th, so for those of you who live in Columbus, OH, be sure to apply soon and submit your application here! Until next time future CNAs. Posted April 8, 2016 by maggie-thompson & filed under Assisted Living Jobs, Become a Caregiver or CNA, Caregiver Job, CNA Job, CNA School, Home Health Aide Job, Live In Caregiver, Working as Caregiver CNA. Hey everyone, it’s Maggie here from the Scholarship team at myCNAjobs. Health Training Services in Texas partnered with us to award a CNA Scholarship to Janice P. Take a guess of how much she had to pay for classes? Well, Health Training Services waived the full-tuition so she attended CNA classes for… FREE! I had the opportunity to call Janice to tell her that she had been selected for the scholarship and she could not have been more excited to hear the good news. The course started soon after and she hasn’t looked back. Now, after lots of hours of studying the material to prepare for tests, Janice passed the class with flying colors; everyone here at myCNAjobs could not be more proud. So, now that Janice has completed classes, what is her next step? Well, she plans to take the state exam in a couple of weeks and continue to work in home health. Now that she has the credentials, she can ensure she is properly taking care of all her patients. Eventually, she hopes to become an LVN so that she can even further her job responsibilities. When I asked Janice if there was anything she wants to tell the myCNAjobs team about the CNA scholarship, she said, “I was surprised but so delighted when I received that first phone call from you. I appreciate the opportunity and this scholarship helped me further my career in more ways than one”. Well Janice, myCNAjobs is thrilled that you applied for this scholarship and we are continuously impressed with your commitment to the healthcare field. Your dedication to patients is incredible and we are excited to see what your future has in store for you. Are you interested in receiving a scholarship to become a CNA? Find CNA Classes in your area and apply here at: Scholarships for CNAs. Posted April 5, 2016 by chanelle & filed under Assisted Living Jobs, Become a Caregiver or CNA, caregiver cna interview, Caregiver Job, Caregiver Training, CNA Job, CNA School, Home Health Aide Job, Nursing Job, Working as Caregiver CNA. Happy Tuesday to our amazing caregiver community! We’re happy to share that our recent CNA scholarship winner, Shameka P., is off to the races in her CNA class. Shameka chose to attend Training Solutions in Norfolk, Virginia. She started CNA classes last month and is loving the program so far! Shameka, we are super proud of you and we’re looking forward to watching you grow a career as a certified nurses aide. Thank you to Training Solutions for providing such an exceptional program for people looking to build a career as a caregiver. We feel very lucky to work with such great partners and to help great people like Shameka connecting to free caregiver training. If you’re looking to make a difference in your local community and/or may be considering a career change, be sure to check out the myCNAjobs Scholarship Program (you can do that here: http://www.mycnajobs.com/scholarship/). Posted April 4, 2016 by chanelle & filed under Become a Caregiver or CNA, caregiver cna interview, Caregiver Job, CNA Job, CNA School, Working as Caregiver CNA. Hi all – Chanelle here with myCNAjobs. I just got off the phone with one of our recent CNA scholarship recipients and had to share the good news. Barbara was recently awarded a full tuition CNA scholarship to attend CNA classes at HPI School of Allied Health. Barbara reports that she couldn’t be more thrilled with the program! She is enjoying the hands on experience and interaction with patients. Last week, her class spent 4 days at a local long term nursing home facility to practice skills like range of motion exercises, turning patients, and transferring folks to a wheelchair. Barbara aced her past three tests and is looking forward to growing a career as a certified nursing assistant. And Barbara, we know where to go to help you find a CNA job . To learn more about applying for scholarships to attend CNA or home health aide classes, visit the myCNAjobs Scholarship Program. Posted March 22, 2016 by chanelle & filed under Become a Caregiver or CNA, Caregiver Training, CNA Job, CNA School, Home Health Aide Job, Working as Caregiver CNA. Happy Tuesday folks. This is Chanelle with the scholarship team over here at myCNAjobs. Some exciting news that we wanted to share! Barbara M. was recently awarded a full-tuition CNA scholarship through our scholarship program and partnership with HPI School of Allied Health. I recently checked-in with Barbara to see how CNA classes were treating her. Barbara reports that she is learning a lot in her program at HPI and in fact, she highly recommends their program to caregivers seeking a good CNA school in Union, NJ. 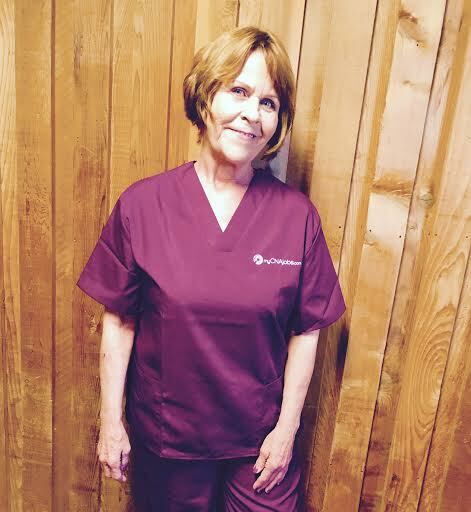 Here’s a pic of Barbara in her brand new myCNAjobs scrubs! Next we look forward to connecting Barbara to local CNA jobs opportunities. Way to go, Barbara! To learn more, visit HPI CNA Classes.